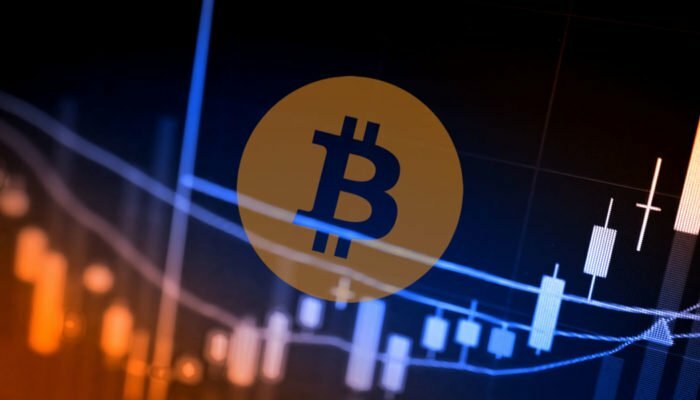 After three weeks of bulls, Bitcoin prices are yet to breach the $6,800–$7,200 main resistance zone. With this, bears are in control as Sep 5 bearish pattern overshadow buy attempts. Remember, this is printing at the time when investors, market influencers and traders are “over the top bullish”. This is all thanks to week ending Sep 23 double bar reversal pattern complete with volume expansion. At the United Nation’s 73rd General Debate, Malta’s Prime Minister Joseph Muscat was very clear: Cryptocurrency is the inevitable future of money. This statement is true and ambitious as the Prime Minister himself. In less than one year, he has overseen the small Mediterranean country evolve to a small blockchain island. It is now a home to several exchanges like Binance and Huobi. These new blockchain start-ups are thriving under Malta’s warm regulations supportive of cryptos. Muscat is at the forefront advocating for proper regulations that will allow for innovation in the blockchain space. He strongly believes that there is many more user case application of blockchain aside from being the future of money and as an effective filter between good and bad businesses. Fortunately, Malta is not the only country in the world that’s a crypto safe haven. Japan has and continues to embrace innovation and not a threat to their economies as Mark Carney stated early this year. Funds as Fidelity, for example, believe cryptocurrencies and blockchain are at a “proof of concept” stage with limited user cases and they plan to explore. While the space can self regulate, the involvement of government regulators who board the crypto bus for the “sake of ordinary investors” isn’t well received by crypto maximalist. All the same, currently cryptos are still in the development stage. Once they grow large enough they can function without oversight of the SEC or CFTC or courts and governments as Satoshi intended it to be. There are two opposing views as far as price action is concerned. There are optimistic traders forecasting gains above $7,200 and 8,000 because of a single bull bar printing at $5,800–$6,000 support. On the other end, there are sentiment-free realists taking contrarian positions. Bitcoin, despite all the euphoria, is bearish and trending inside a descending wedge. When we take a top down approach, buyers are literally struggling to add to week ending Sep 23 longs. By doing so, it means week ending Sep 9 overshadow are literally clipping gains giving bears a upper hand in an effort versus result scenario: Two back to back bullish gains didn’t reverse losses of a single bear bar of week ending Sep 9. 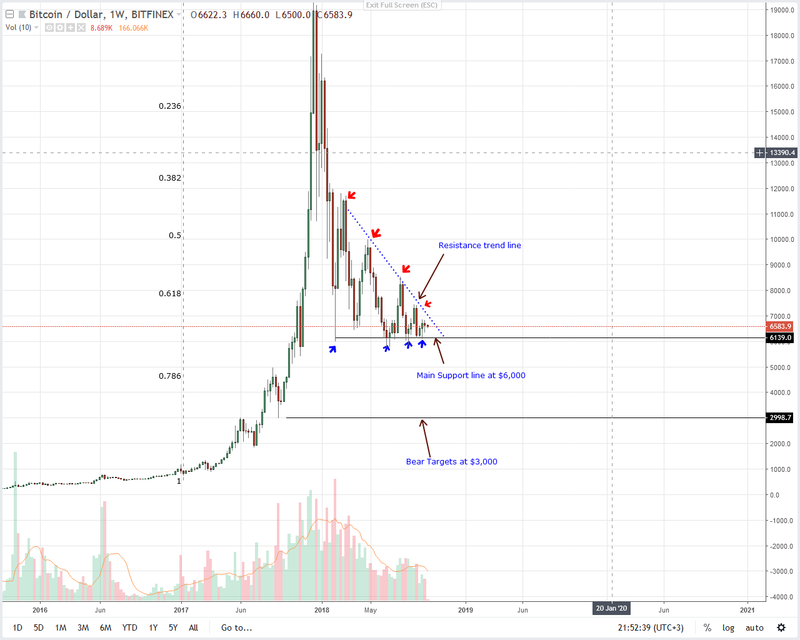 This is why, like in our previous Bitcoin price analysis, as long as prices are trading between $7,200 and $5,800 supports, we recommend staying off. Once there is a definitive break out in either direction, that’s when traders can begin ramping up trades. 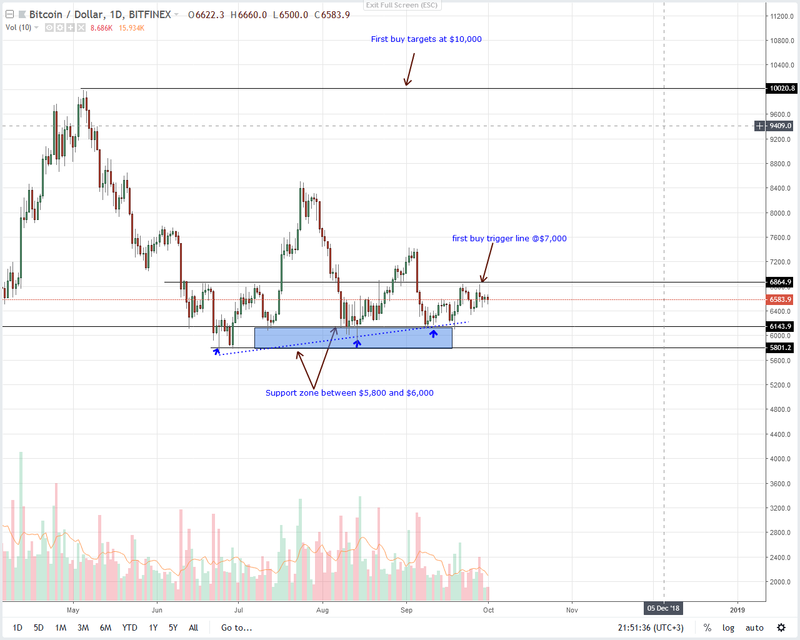 Depending on break out direction, first targets can be at $4,500 or July 2018 highs at $8,500. In the daily chart, prices are in consolidation moving inside Sep 27 high low with caps at $6,800–$7,200. Regardless of prevailing sentiment, we retain a slight bullish to neutral stand in this time frame. From our early reiteration, we shall only suggest trades once there are moves above $6,800 and $7,200 on the upside. This is when after BTC prices are trending above the wedge and the main resistance trend line in the weekly chart. At the moment, we remain neutral.